The Flighty Joustmite (トビカブリ?, lit. : "Flying Head") is an enemy in Pikmin 3. This creature has the ability to fly, unlike other burrow-nits. It acts much like the Cloaking Burrow-nit and the Joustmite, in that it lashes its proboscis out to eat Pikmin, and has a fleshy area for the Pikmin to attack. The Flighty Joustmite is not very common and is only seen in a few areas, and only in Pikmin 3. 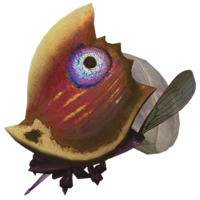 The Flighty Joustmite, like the Joustmite, is a passive creature, only ever coming out of the ground when Pikmin or a leader is nearby. Once awakened, however, it will turn very aggressive. Like the Joustmite, its main form of attacking is by lashing out its proboscis to eat Pikmin. It keeps its face and front protected, while leaving its back open for attack. If a quarter of its health is depleted, it will attempt to take to the skies. If while airborne, it attempts to eat a Pikmin and misses, its proboscis will be stuck in the ground for a few seconds. The Flighty Joustmite regenerates health at all times, and can fully heal in 120 seconds, or two minutes. When its health reaches 90%, it will return to the ground. The Flighty Joustmite with its proboscis stuck in the ground. The Flighty Joustmite attacks by flying and stabbing its spear-like appendage straight down upon its prey. They can also attack while on the ground. If it misses whilst airborne, its joust will be stuck in the dirt for multiple seconds, making this an opportune time to attack it. To do so, you must hit the fleshy white part on its back, which isn't guarded by a shell. Rock Pikmin make fighting this creature a cakewalk, as they are immune to its stabbing proboscis. Once it has lost half of its overall health, it will begin to fly. While in the air, it is harder to hit and its health will regenerate quickly, much like the Shearwigs do, so Winged Pikmin are recommended to use when it is airborne. If more than 10 Winged Pikmin grab onto it, the creature will plummet to the ground and fall on its side, leaving itself vulnerable to further attack as it struggles to reorient itself. Yellow Pikmin can also be thrown onto it, but it is much harder. "Flighty" means "not serious", although it also has the archaic definition of "swift". The Flighty Joustmite might also be called that because of how "flighty" relates to "flight", referring to how this Joustmite can fly. Its Japanese name, トビカブリ? means "Flying Head", with カブリ? (lit. : "head") being one of the words in the Joustmite's name. Its internal name, tobikaburi simply matches the Japanese name. French Cachepique ailé From cache (hide) and pique (pike); ailé means "winged"
The Flighty Joustmite being scanned. A Flighty Joustmite attacking the player. Side view of the Flighty Joustmite. A Red Pikmin being sucked by a Flighty Joustmite. A Red Pikmin completely sucked by a Flighty Joustmite. This page was last edited on April 14, 2019, at 20:52.